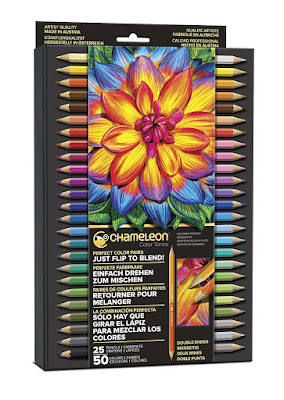 The Splitcoast Product Focus today is all about these Chameleon Color Tones pencils! I'm so happy to have had a chance to play with these. Here's what I know! --Most split-color pencils we've seen have been scholastic quality. 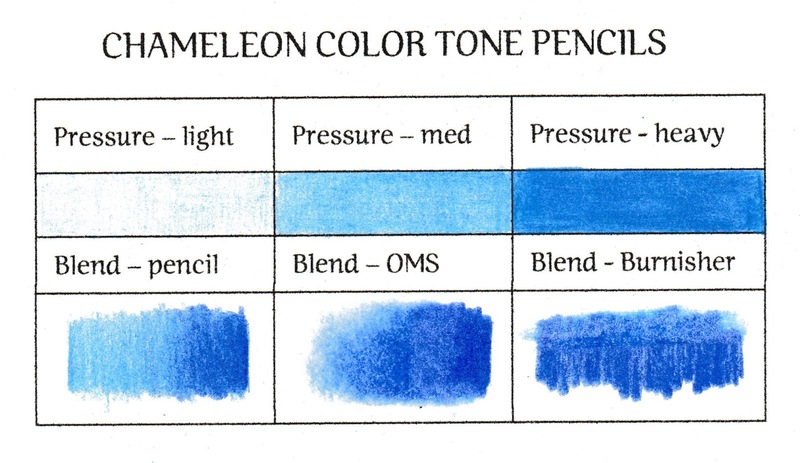 Color Tones are the first artist grade pencils of this kind. --They are wax based, and highly pigmented. The wax in the binder is harder than other wax pencils. It allows the pencils to keep a sharp point for much longer than other pencils in this category. The leads are very strong. And presharpened! --The color cores of each pencil are bonded from end to end, so they are break resistant, even when dropped. The wood is high quality, and won't snag in a sharpener. --I have to confess I'm always skeptical of new pencil collections, when there are such high standards from companies with centuries of experience. But... these pencils are manufactured in Austria, by a company who has been producing quality colored pencils for over 150 years. The packaging of the pencils is impressive from the start. The box is very sturdy, and closes with a magnetic flap. Once open, the box folds open under itself to create an easel for the pencils. So convenient. the case would be easy to tuck in a bag for a trip or coloring on the go. Each pencil is also labeled with a number and both color names. Each number corresponds to the color index that is included inside the box. I have done other pencil reviews, so I used the same chart for a few simple tests... my scanner did some auto tuning which affected the lightest pressure area, but otherwise, the scan is pretty accurate. You can see that the pencils are able to produce all shades (light to medium to dark) from each color, with very even coverage. I tried my 3 standard blending methods, and the pencils performed wonderfully. I shared my card samples in full in some blog posts last week, but here are some close-ups of each of them, with my thoughts! All the images were stamped on Strathmore XL Bristol paper - I love this particular paper pad because the paper has two different surfaces. I usually use the rougher side, but if you prefer smoother paper, or you're not sure which you prefer, you've got both options to choose from. The sample above was colored with a single pencil, using both ends to layer color. It was very easy and felt really natural to just flip the pencil back and forth. The colors are so well matched, and blend together so easily. The giraffe was blended in the same way - just lots of patient layering of color. I stamped this little guy in a light color for a no-line effect, and used both of the brown pencils (4 tones) to color him in. I colored the snail image with a variety of colors, and blended my coloring with odorless mineral spirits - again, the colors blended perfectly and stayed vibrant because of the high pigment load. The pencils performed well on kraft paper as well, and remained vibrant - I really like that effect. I was watching product videos from Chameleon that were taken at Creativation and one was a demonstration of the pencils being used on wood, so I had to try that out as well - and WOW! The colors blended well and stayed vibrant and true on the smooth wood surface. I'll have to try this again! OMG!!! Your samples are so Pretty! I have been looking for a nice set of pencils and so far have not had good luck... but these look perfect for me... I'll have to look into them for sure.. I will definitely be looking at these, thank you for such a thorough review. I only wish my coloring skills were almost equal to yours! I always look forward to your reviews because I can count on them being accurate -- when you say something is good, it is REALLY good - not sort-of-kinda-good. Was wondering if there's a sharpener you favor...... Thanks for all your posts. 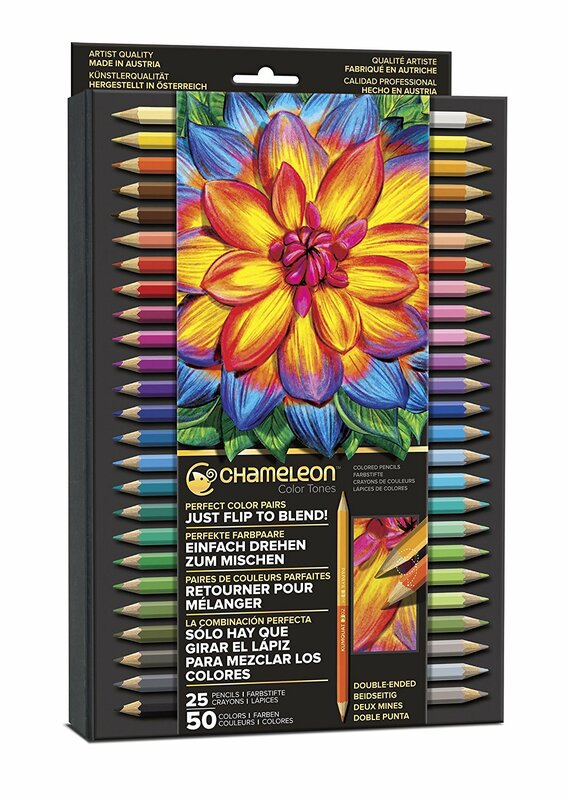 I have soooo many pencil sets, but due to the Kickstarter deal for Chameleon's new Color Tops, I also ordered these pencils. I'm looking forward to trying them out when they arrive, this is a great review, and I really trust your review and critique of their performance. I got my Color Tops today! Thank you for your insight and testing. These intrigued me and was thrilled when I saw your input. I will plan to purchase these!